Mark and Wufan were one of couple who is very clear about what theme they want for their wedding. 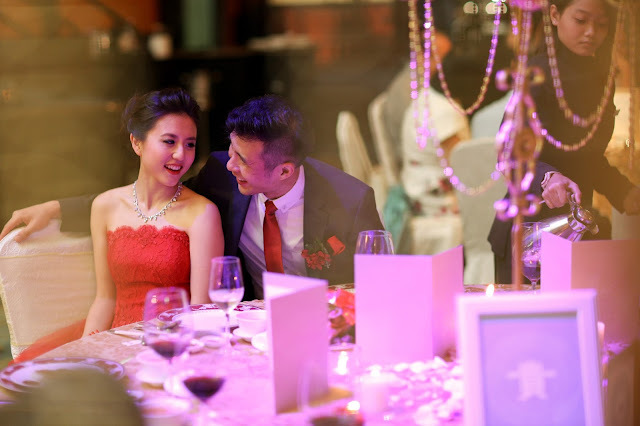 It's make every things easy from the starts and leave us more time to look at many other details of their weddings. "We chanced upon Hitched Weddings when surfing the web for wedding planners, and decided to go with them after our first meet up with Denise, who made us feel very comfortable and was very keen to make our theme work for us. Though out the entire process, Denise was very patient and accommodating to all our requests, and tried her best to make them work for us. At the same time, she also gave her professional inputs and advice, that really helped to make the entire event such a success. We were especially glad to have Denise and her team with us on the wedding day itself, as they really took the worry off everything and we had such a great time just having fun, and enjoying the wedding. Our heartfelt thanks to Denise and Hitched for helping us realise such a special and memorable day for us!" It's always a privilege to be part of someone important life event. Wedding is definitely one of those. Mark and WuFan, thank you again for trusting us to be part of your life journey. My husband and I had our wedding reception at this place. It was absolutely perfect! The manager and his staff from wedding venues nyc were excellent and wonderful to work with. You won't be able to find more for your money. The San Francisco Florist understand that if you care enough about a person to send them flowers, the arrangement must convey that deep sense of love, or gratitude, or whatever emotion you are feeling. iGRACE Professional Event Organisers is the one of the best event organisers in vizag and giving best service for wedding,audio function,bithday parties and many more events..